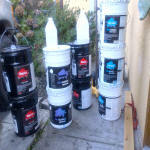 AHF All Hardwood Floor ltd Dustless Dust free hardwood floor sanding. 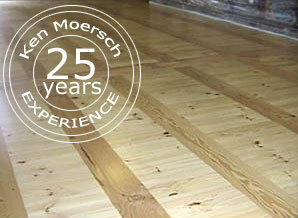 Traditional time honored methods practices and quality built American floor sanding machinery and dust containment systems all work performed by 35 years experienced Swedish wood flooring sander craftsman of local Vancouver hardwood floor re sanding knowledge .AHF sanded wood floors are stunning and exceptional in quality . Industry standard Work Safe BC compliant Hardwood floor sanding utilizing High Quality American Made Hardwood Floor sanding Machines and Matching Dust collection containment systems are perfect for all hardwood locations for on site sanded wood flooring. After all , All hardwood floors will need to be resanded at some point. AHF's Ken has a great advantage sanding wooden floors with our Cadillac's sanding machines the Clarke American Twelve floor sander, Simply put the best twelve inch floor sander machine, "the Cadillac of the hardwood floor sander industry". When a stain color is required the twelve can be followed by an Clarke American Floor crafter eight inch Belt Machine the best eight inch belt machine ever made. Our floor sanding process involves rough angle sanding Most hardwood floors will require to be rough sanded especially the plain sawn or flat grain planks and strips, parquet floors fore sure. 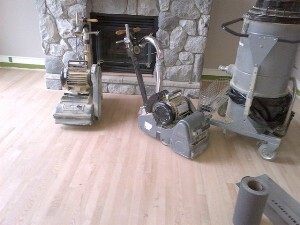 three to four sanding passes are required and i will usually do the edging perimeter floor sanding three times around, The sanding passes are a complete once around the whole floor with rough medium and fine sanding grits. Full trowell flood filling in between sanding and graduate sanding to a fine one hundred grit or double oo . Sand with a sanding screen to burnishing with a polisher after hand sanding all the short ends and lengths and this hardwood floor surface is ready for the next process either staining the hardwood floor a stain color or a variation of a natural clear(transparent) or natural opaque(pastel ) keeping the wood floors light as possible and leaving the future repair touch-up or maintenance options open for many years down the road, such as screen and recoating to renew the original sparkle and shine. This is what sanding the floor is all about preparing for the finish. Hardwood floor sanding is an on location service, Let us come to you we will be bringing the best hardwood floor sanding machinery and sanding tools maintained to make my life easy and your floor look fantastic from there its all about the passion, patience, perseverance, skill knowledge of master craftsmen floor layer Ken Moersch to bring alive amazing wood floor results on your hardwood floors, stairs or gym flooring. AHF-All hardwood floor ltd able to engage a broad range and wide variety of surface areas for refinishing resurfacing restoring and more, American Hardwood floor sanding machines: Clarke American twelve, Clarke American eight belt, Clarke Gym Floor Rider. Hardwood floor sanding machine and tools require 220 Volts at 30 amperes. Gym floor rider setup needs a 90 amperes breaker 3 phase 208 or 480 volts. two-thirds of the length of the floor in front of you. the pass, gradually raise the drum off the floor. Practice before turning on the machine. to the floor as you begin the backward pass. and sand the remaining third in the same manner. blends the two areas together. Rough sandpaper that will be used on the drum sander. paper as the first drum cut to remove old finish or level abused areas. Many professionals will rum a rough cut on a 45 degree angle. corners and obstructions to be scraped later). Along walls parallel across the ends by not letting the edger go onto the drum sanded field. Follow flooring direction, move back and forth from left to right with the direction of the flooring, also trying not to overlapping into the drum sanded area. The edger typically cleans a 1” to 2” strip on each pass. operation using the fine grit sandpaper on the drum sander. operation; check with the supplier or manufacturer. blanket glued around it makes a good sanding block. reach, and to remove old finish in tight spots. Always scrape in the direction of the flooring grain. Then hand sand or oscillate scraped area. forth with the direction of flooring boards. Parquet, block, herringbone and similar floors. is considered a minimal sanding procedure. a final fine cut with the room’s longest dimension. wear through to reveal nails and professional wooden floor sanding is recommended. that an edge of the flooring can be measured. just mentioned, to the thinner materials. is generally flattened, coarser grits are not necessary. to use paint remover to uncover the wood surface. the old finish is removed. first cut parallel to the flooring strips. which creates a rough surface. all dust on windows, sills, doors, door frames, and baseboards. with fine sandpaper, same grit as final sanding. absorbent to moisture and foreign materials. finish and use only compatible products. materials should be referred to the finish manufacturers.